Are you interested in working as a hair stylist? Is a job in a salon your idea of a perfect position? Here are the education and job requirements, salary information, and tips for finding a job and getting hired as a hair stylist. Hairstylist is one of the jobs you can qualify for quickly. You will be required to complete a state-approved training program which typically lasts 9 months or longer. States require between 1000 - 1600 hours of practice and theory to get a license. Some individuals complete a full associate’s degree. Programs for hairstylists include methods for hair coloring, conditioning, shaping, shampooing, and styling as well as legal regulations and professional ethics. Management and sales coursework are also included in some programs. All 50 states require hairdressers to be licensed. 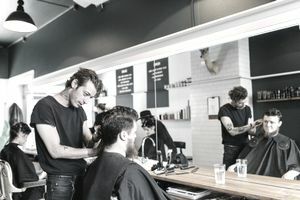 After completing an approved training program, candidates must pass a written test and sometimes a hands-on test of hairstyling techniques or an oral interview. Here’s information on average salaries for hairdressers, hair stylists, and cosmetologists. Hair Stylists need the manual dexterity to cut hair in precise ways. You should have a well-developed sense of aesthetics to recommend styles which accentuate the positive features of your clients. Hair Stylists need creative flair and adaptability to follow trends in styling and apply them to different heads of hair. Stylists should be well groomed and model appealing hairstyles to inspire confidence in clients. You will need solid interpersonal skills to establish a comfortable rapport with clients. Interviewing and listening skills are essential in assessing the preferences of customers. Sales and customer service skills will help stylists to promote services to clients and encourage repeat business. Problem-solving skills are required to fix flawed cuts and to deal with clients who have hair that is difficult to style. Physical stamina is needed to withstand long hours of standing while serving customers. Here’s a list of hairstylist skills. Be sure to incorporate them into your resume and cover letters, and mention them during job applications. Your resume and cover letter should showcase all your relevant skills. Here are some tips on how to find a job as a hair stylist. Demonstrating the ability to cut hair into appealing and attractive styles is a vital step in the job search process for stylists. Creating a viable portfolio is an effective way to show how you have transformed heads of hair in the past. Take quality before and after photos of clients you have serviced and incorporate them into your portfolio. Secure recommendations from salon managers and testimonials from satisfied clients and include them with your photos. Consider showcasing your portfolio through a website so you can attach the address to your resume or conveniently show your portfolio to employers on your IPad or other mobile devices. Networking with salon owners and stylists is an excellent way to launch a job search in the field. Start with salon owners/stylists whom you know and get referrals from friends to salons which they frequent. Contact instructors from your beauty school and ask them for introductions to professionals whom they know. Approach these individuals and ask if they could meet with you to provide some feedback about your portfolio. Identify salons within your preferred work location and visit them at times when the salon is not busy. Ask to speak to the manager/owner. Ask if they might be available for a quick review of your portfolio now or at a later date. Offer to show them recommendations or a letter of introduction from an instructor or a previous salon where you have worked. Tap specialized beauty websites like behindthechair.com and salonemployment.com to secure listings of jobs in the field. Search job sites like Indeed.com and Simplyhired.com by keywords like "hair stylist" and "hairdresser" to generate more job listings. Owners and managers of salons will be interested in your ability to generate business for their salon. If you have worked in a salon, make sure you can describe the volume of business which you attracted with particular reference to repeat customers. If you have worked for other local salons and have a book of customers who might follow you to your new employer, that information can be quite persuasive. Be ready for questions about the latest hairstyles. You will often be asked about which styles and treatments are your favorites and/or which you can best execute. Use your portfolio to reinforce what you are asserting. You will often be asked about your approach to customers so be prepared to share information and examples about how you engage clients and handle challenging situations. How many clients do you typically see in a day? In a week? What kind of establishment are you interested in working in? Why are people important to you? Have you ever dealt with an irate customer? Do you have experience in waxing or esthetics? Why are you interested in the beauty industry? Have you done anything to further your education? How do you keep up with style trends? What would your salon colleagues say about you? Do you work to targets? If so, how often do you hit your targets? Have you worked retail in a salon before? Would you feel comfortable doing so? Why do you want to work at this salon in particular? How do you handle multitasking? Tell me about a time when you had to handle many responsibilities at once. Do you work better as a part of a team or on your own? Why? What do you think defines good customer service? Do you have a work portfolio you can show me? How you interact with your interviewer will be as valuable as what you say in an interview for a hairdresser job. Exude warmth and friendliness and bring a ready smile to your interviews. Salon managers and owners will be looking to see if you are the type of individual that their customers will like on a personal level. Show some style in your dress and, of course, have your hair and makeup impeccably groomed. Compose a handwritten thank you note and deliver it to the salon as soon as possible after your interview. Or, if you are short on time send an email thank you message. Emphasize why you think you are a terrific fit for that salon, state that you would really like the job and thank them for their time.